Kathmandu, the capital of Nepal, is located in the Kathmandu Valley. 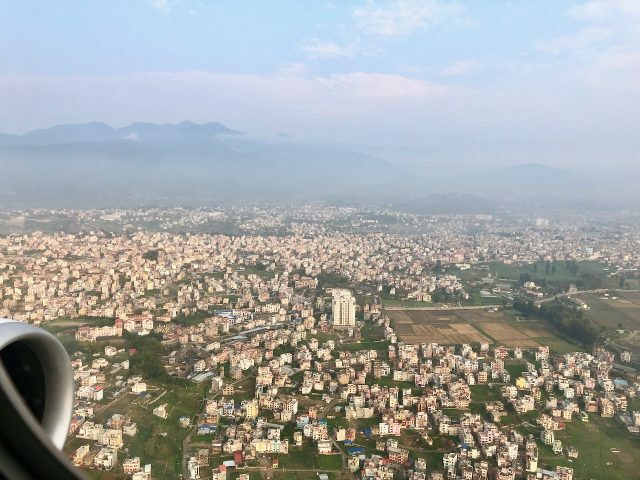 Flying into or out of Kathmandu (map) is an amazing experience on clear days – those seated by the window will be rewarded with panoramic views of the valley and Kathmandu. On the approach into Kathmandu, the plane basically follows the line of the valley, with the mighty peaks of the Himalayas on the horizon. If you’re lucky, the plane may take a flight path closer to the Himalayas (from a northeasterly direction). 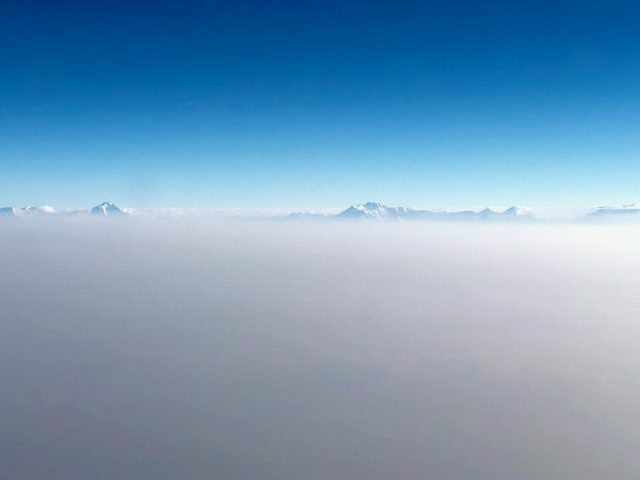 On my flight to Kathmandu (from a southwesterly direction), I saw the Himalayas in the far distance before the plane descended into the clouds. 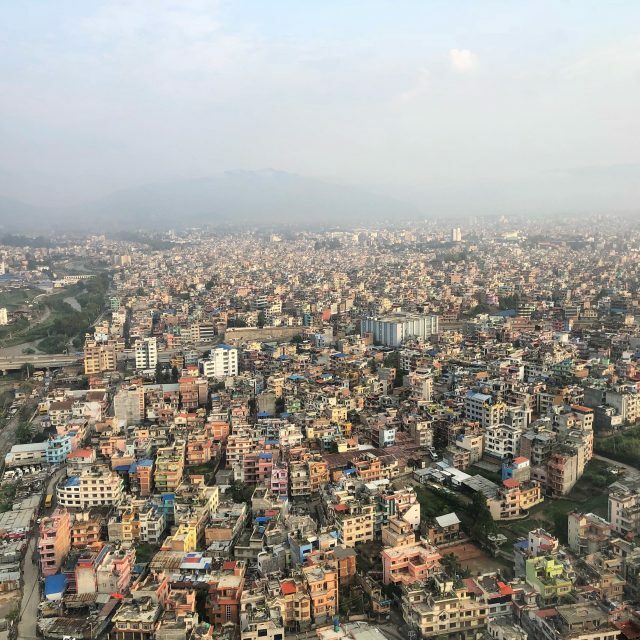 The plane then passed villages sitting precariously on the mountainsides before the urban sprawl of Kathmandu came into view. The Himalayas can be seen in the far distance. My excitement grew as the plane made its final approach into Kathmandu, passing mountains on both sides. A road snakes its way along the mountainside. It sure looks precarious! The plane approached Kathmandu Airport from a southwesterly direction. Yep, it’s a crowded city! My first glimpse of Kathmandu traffic just before touchdown. 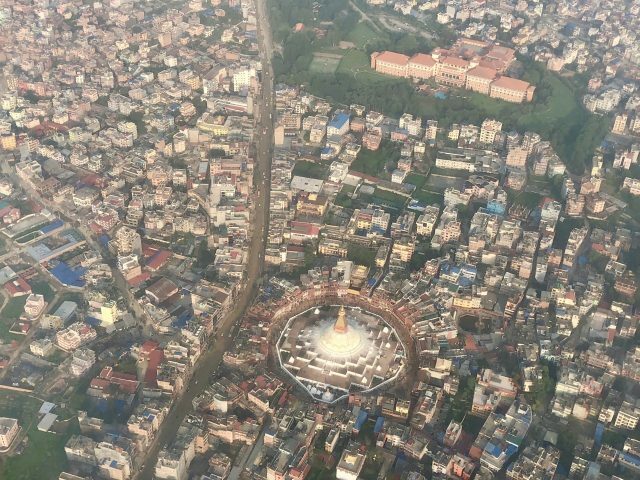 If the plane approaches from the northeast, those sitting on the right side of the plane will be treated to fantastic views of the historic centre of Kathmandu, including the iconic Great Boudha Stupa, just before landing. Or conversely, you’ll get this view if you sit on the left side of the plane (row ‘A’) if the plane takes off towards the northeast. 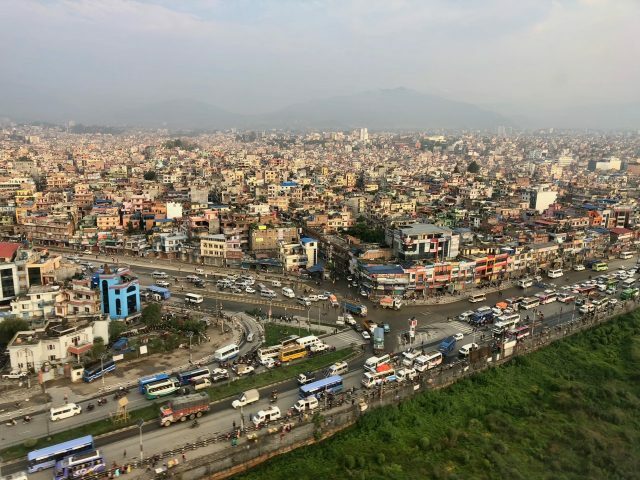 A panoramic view of Kathmandu and the iconic Great Boudha Stupa. If you’re flying into/out of Kathmandu, my advice is to book a window seat. It’s hard to say which side of the plane is best as this depends on the approach/take-off direction. For what it’s worth, I sat in row ‘A’ on my flights into and out of Kathmandu. Tribhuvan International Airport Kathmandu is located about 5 kilometers from the Kathmandu city center, and has one international terminal and a separate domestic terminal (within walking distance). On your way into the city, about 1 kilometer from the airport, you’ll pass one of several UNESCO World Heritage sites in Kathmandu: the Pashupatinath Temple. Thanks Emma! I use an iPhone for my photos/videos. Nice Photos, what camera do you use? Last year I visited Kathmandu. It is really a nice place to visit. Thanks for sharing awesome photos.